For the students possessing attributes like great flexibility, determination, commitment and attention to detail. Poomsae Competition is growing fast in United States as well as worldwide. Access to our Elite training is by invitation only. Please contact our Instructors for more Info. What is the Taekwondo Poomsae? 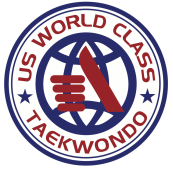 According to the World Taekwondo Federation presentation, The Poomsae is the style of conduct which expresses directly or indirectly mental and physical refinements as well as the principles of offense and defense resulting from cultivation of Taekwondo spirit and techniques. The poomsae is a series of movements for offense and defense techniques which can be practiced and trained, even without presence of an instructor, in accordance with the fixed patterns. Therefore, the poomsae has the merits, by its practice, to make the trainee enhance the Kyorugi techniques and applied techniques including special techniques which can hardly be practiced by the training of each separate basic movement alone.